As a wedding photographer in Albany NY, I’m always watching for detail images that can be made live, when things are actually happening. The exchange of rings is a great photo to make at an Albany wedding if I’m able to get close enough during the ceremony. Certainly this isn’t possible with an church wedding as decorum prohibits it. But sometimes with a long lens which allows me to stay back from the wedding ceremony, sometimes everything aligns (from where I’m able to stand to the dramatic natural lighting, to the gesture made in the moment) where everything just works out perfectly to make a great photo. 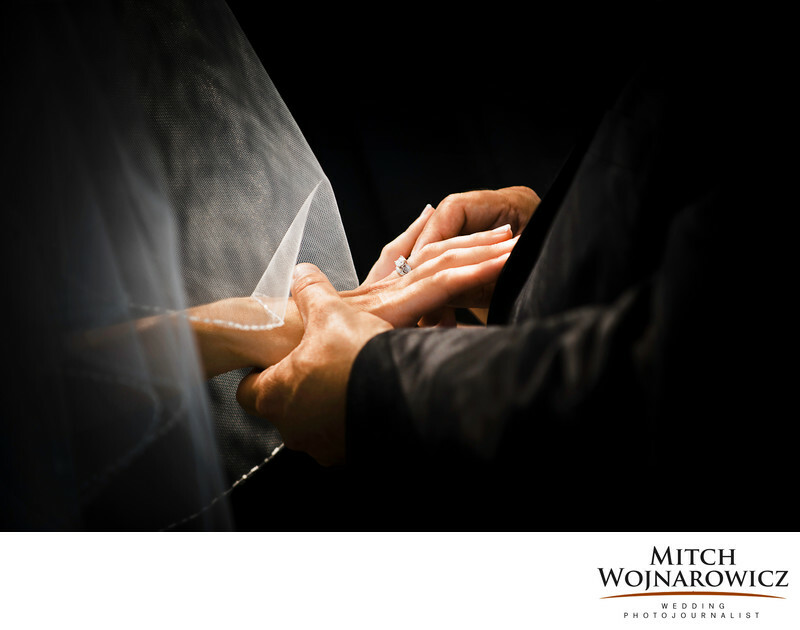 It is a component of my style in creating Albany wedding photography where I don’t shoot endless detail photos. Do you really want lots of photos of possessions? My approach is that you want photos of people, of places and times during the wedding day. Of each other relating and reacting. Those are the sorts of photos which will stay with you years down the road. The ones which will allow you to remember how the day felt to you. If your photographer shows lots of detail photos then you should know that you’ll probably be getting less of the meaningful types of photos where people react to each other, where great portraits are made in a beautiful setting. Do possessions define who you are? I think a great photo with grandma that happened spontaneously speaks much more deeply to who you are and what is important in your life. This image came from a Western Turnpike country club wedding. An outdoor wedding like this at a country club is a very familiar commission for me. I have photographed many outdoor weddings at venues like this one, so I’m familiar with the setup and the logistical challenges of such a day. As a very experienced photographer, you don’t have to worry about me. I’ve seen the different challenges an outdoor setting like this can pose and have successfully navigated them. So you don’t have to concern yourself about whether I can handle the challenge of a barn or a field, of a lakeshore or mountainside. Location: Western Turnpike Golf Course.